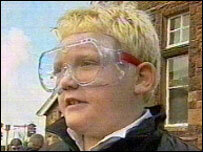 A headteacher has bought safety goggles for his pupils to wear when they play conkers in the playground. Shaun Halfpenny, of Cummersdale Primary School, in Carlisle, says he took the step to ensure pupils can carry on playing the traditional game. He invested in six pairs of industrial safety goggles and now pupils queue up at breaks to take turns to use them. 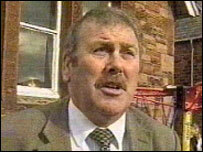 Mr Halfpenny said it was a "sensible" step to protect children's eyes from pieces of flying horse chestnut. The idea came about after pupils gathered dozens of conkers while they were on a school trip and asked Mr Halfpenny if they could play when they got back to school. He drilled the holes through the conkers himself and told the children they must wear the industrial safety goggles to play. Mr Halfpenny said: "I said they would have to wear goggles to play, mainly because they could get bits of conker in the eye. They thought it was a great idea. "They all came in this morning ready. They think it's terrific. Some of them have not played before. It's a wonderful tradition. "It's just being sensible. We live in a litigious society." Pupils now take it in turns to use the safety glasses and Mr Halfpenny said the conker playing had livened up break times. He said: "You have got to have some fun in education. The goggles haven't taken away from the fun, what it has done is increased their enjoyment. The parents think it's fun too." Pupil Danielle Armstrong said: "It doesn't stop you from having fun because you still play the game. It's just protecting your eyes at the same time." And Jordan Maxwell, who also attends the school, approves of the glasses. He said: "I think it's a very sensible idea and it doesn't change the experience. It doesn't hurt to be safe." The National Association of Head Teachers said it showed how much teachers were being driven by the threat of litigation. General secretary David Hart said: "I think it's better that they [the children] should be protected rather than ban the game entirely." Keith Flett, from the Campaign for Real Conkers, said he was pleased pupils were being encouraged to play conkers. But he said: "Well it is a little bit over the top. 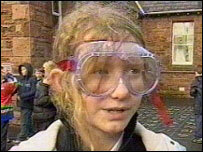 I am all in favour of health and safety particularly on building sites, but I am not sure about goggles for conkers. "If it's an official school activity, which I would applaud incidentally, then fine, hand out the goggles, but if they are doing it in the playground or walking along to school or home from school, I think leave them to get on with it." Cumbria County Council said in a statement that it was up to individual schools to decide what games were appropriate for the playground.